Source: Produced in Sf9 insect cells. Recombinant human MKP-5 fused at the N-terminus to a His-tag. Produced in a baculovirus expression system. Specific Activity: ≥50 U/mg assayed by 3-O-methyl fluorescein phosphate (OMFP) hydrolysis at pH 8.2, 30°C. One unit is equal to 1 nmole phosphate hydrolyzed from OMFP per minute. 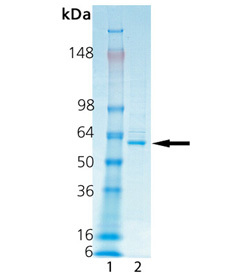 Scientific Background: MKP-5 (DUSP10) is a member of a group of dual specificity phosphatases which negatively regulate MAP kinases, dephosphorylating both the phosphotyrosine and phosphothreonine in the pTXpY activation loop motif. MKP5 has a principal function in both innate and adaptive immune responses. SDS-PAGE Analysis. Lane 1: MW Marker, Lane 2: 1.0µg of purified MKP-5 (human) (recombinant) (His-tag).